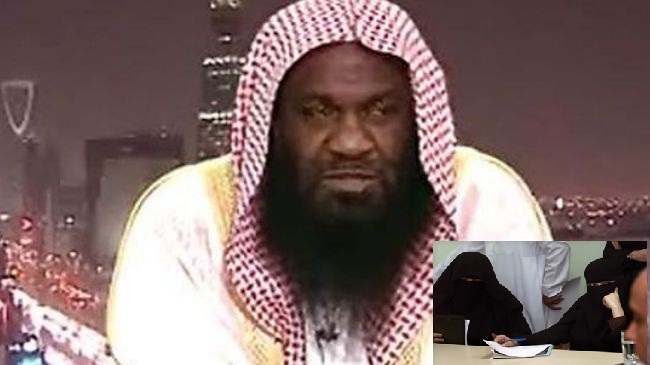 JNN 21 Feb 2014 Riyadh : A top Saudi Wahhabi cleric has scolded women who visit male doctors without being accompanied by a male guardian, claiming that is prohibited by Islam, Al-Hayat daily reported Thursday. His remarks follow the death of a university student last week after paramedics were denied access to her campus because they were not accompanied by a male guardian, or close relative, a must according to the strict segregation rules in the Muslim kingdom. “Women are becoming negligent in consulting doctors without a mahram (male guardian), and this is prohibited,” Al-Hayat quoted Sheikh Qays al-Mubarak, a member of the Council of Senior Ulema (Muslim scholars), as saying. A medical check-up could include “a woman showing parts of her body to a doctor. This is not permissible… unless urgent,” he said. Women “must seek help from a male doctor only when a female medic is not available. When this happens, they must not be alone and the doctor must only look at the pain” part of the body, he said. The Council of Senior Ulema is the highest religious authority in the ultra-conservative kingdom. Al-Hayat said the notorious religious police in EasternProvince have enforced restrictions on women entering several private medical centres without a male guardian. “Members of the Commission for the Promotion of Virtue and Prevention of Vice have entered a health and diet centre and prevented women from consulting a male dietician without the presence of a mahram,” Al-Hayat reported. AFP could not immediately verify these allegations. In 2002, 15 girls died after a fire broke out at their school in the holy city of Mecca and religious police blocked their evacuation because they were not dressed in keeping with Islamic codes. Witnesses said male civil defence workers were kept at bay because, in their haste to escape the flames, the 12-to-14-year-olds had not put on their black abaya robes, which cover the entire body. Saudi Arabia imposes a strict interpretation of Islamic laws, notably a segregation of the sexes, and does not allow women to work or travel without the authorisation of a male guardian from her family. It is also the only country in the world that bans women from driving. This entry was posted in Middle East and tagged Al Hayat, Council of Senior Ulema, Doctor's Appointment, Female Patients, Guardian, Male Doctors, Mehram, Saudi Wahabi, Saudi Wahabi Relgious Scholars. Bookmark the permalink.